Right, you're not testing the same set up but it helped me figure out that the problem appears to be "get axis vector" not translate in real time. Do you know how I could sort this out? it looks like "get axis vector" just stops getting anything when time scale is set to 0. I appreciate the time and effort to help me with this problem. Again, I'm not sure what to tell you but it's not working. 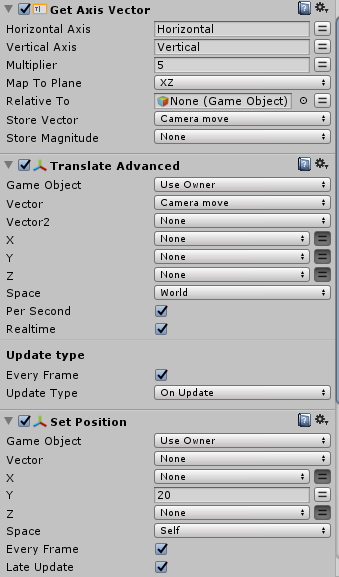 I've tried moving object in real time and that works fine, but translate doesn't work in real time when time scale is set to 0. Have you tried it? it doesn't work. I'll take a couple of pictures to show my set up so you can see. it's very easy to set up. And the time scale is just a few buttons that when you press them they set a different number to the action "scale time". it works fine with any "scale time" number except 0. 0 stops the camera despite translate being in real time. I'm not sure why. So unfortunately, it only half worked :/. It stops the camera from moving faster if the speed is increased, so the camera now moves at the same speed at almost any game time speeds except when the game is paused. the real time ticker still fails to produce any movement from the camera when the game time is set to 0. This is odd behavior. Do you know what it could be? You're a star, Jean. thanx a lot. I'll download it sometime soon and I'll let you know if I run into any problems with it. Thanks for the fast reply, Jean. I'll just wait for the modification to translate tbh. I'm not familiar with itween and time is not of the essence when it comes to this issue. I'm surprised no one has asked for this before though. Thanks and let me know when the real time is implemented so I can download it. appreciate it, Jean. EDIT:- Sorry I forgot. I am using "per second". Here is a pic of one of the fsm i'm using. How do I translate in real time? is there a custom action for it? I've got a time manipulation mechanic in my game and it stops me from moving the camera whenever the game is paused. also at faster speeds it moves the camera faster. I could make it so the time manipulation works with a variable that changes the speed of all the other objects but that's a lot of work when I could just press "real time" on the camera translate instead. (PENDING SOLVED(Ignore this part for now)) Jean was kind enough to add it to a downloadable action called "Translate Advanced" find it in the ecosystem in playmaker and download it. The fix is that it now contains a "real time" option. this is what I'm looking for. I thought this was pooling but I'm not sure. I appreciate the fast response and I've heard of the specific asset in question. It's one of the ones I've got in mind. but your post didn't address the specific issue I'm interested in. Will your tutorial address this issue? Do you know if the asset in question has a solution for the specific issue or is there something else I'll need to do? I'm not a programmer so I might be doing things completely different too. Any help here is welcome. thank you. EDIT:- I thought of posting a picture with my setup. it might help. I'm not that versed in pooling and I'm not sure if I can post here about this but I'm just looking for advice on what polling solution to buy if possible. I'm under the impression that polling works as follows. you poll like 6 items for example and those 6 items get used instead of the engine creating new items or w/e. I get that but the problem i have is that the items i'm looking to poll will have stats. think of a menu for example. would polling be useful for scroll view? Because I'm getting a lot of lag in scroll view. But then the menu pieces need to have data and keep that data every-time the menu is opened again. how will that work if the same 6 items are polled? Any help here is greatly appreciated. I've looked at some assets in the asset store but I'd rather know exactly how they will help me with my specific problem before I spend my money and realise it might not even work or something. Playmaker Help / Re: How exactly do state machines work? FSM arrays really can't compete at this point for me. Don't think they can be saved with easysave nether from what I've heard but could be wrong. Anyway I wouldn't say this is solved because ultimately I'm having to use something else because of a missing feature of fsm arrays. Thank you for all the replies though, guys. I appreciate the help. Well maybe I'm doing something wrong. The way I've got it set up now is I have an object called spawner. I have the prefab called "troop". And I have a manager called "name generator"
The spawner spawns the troop and the troop decides if it's gender, race, class, etc. Then it looks for managers that randomly generate those things. the manager in question at the moment is race and gender. 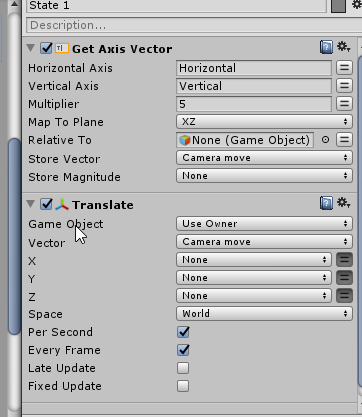 once it figures out those it will pass itself as a gameobject variable to the name generator. then the generator can extract the information from the troop. To pass it over from the troop to the name generator I can't use a "add array" on the troop or the spawner because it doesn't add to the array of another fsm. So the "troops array" in the name generator is a different object completely with a different fsm. With array maker you could add to another object by name If I remember correctly. Maybe I'm just not doing it right but as I said, I used to use this method in array array maker. I'm not a programmer so maybe there is a better way to do this. I don't know. you can then generate unique Id using the index of a particular object inside this array. This is how I used to do it with array maker, but with fsm array it is required that I set the fsm array. there is no simply add to fsm that I can see like there was with array maker. Maybe I just have to download array maker until this feature is implemented in fsm array. Unless it is there but I'm not seeing it. Not sure I completely understand your question. But when your troop triggers the manager, have it set a bool to true "in use". When the manager is done, on the last state, it can change itself back to false "in use". When each troop tries to use the manager, have them check the bool first. If its true, then have them wait .1 second and try again. (No idea how long your manager takes). Then two troops cannot go through the manager at the same time, and will queue themselves. Does that answer your question??? OK it actually looks to me like you get what I'm saying even though you aren't sure. I can confirm you're on the right track though. I've thought of doing it like that as a queue system, but when I think about it, the "troop" would have to get the bool state first from the name manager. then it has to check it. then it has to pass the information back. What if between it doing all of that, another "troop" does the exact same thing at the same time? then two "troop" prefabs would be checking the bool and coming up with it being false. then both would transmit the data and it looks to me like it would mess it up when the name manager is doing it's thing. Right. I know this, but my question is about how I would go about doing this considering if two troops tried to access that manager at the same time. I know I have to get the generator to set the fsm of the "troop" that's my goal. The problem is how to do it without glitches in the future. Playmaker Help / How exactly do state machines work? I'm going to provide an example because I'm not really sure how to ask this question. I have a spawner and that spawner creates named troops. I have a manager game object that generates names based on certain specifics about the troops like race for example in an rpg game. I have the "troop" prefab spawn with the ability to tag itself into a "self" variable and it is given the manager game object by it's spawner. So no problems there. The troop passes it's "self" variable to the manager so it can start generating a name for itself, then the manager gets the name back to the troop. The potential problem might come when two "troops" are both targeting the same manager. I'm not really sure if I need to create some sort of queue system in the manager or what. I'm not really sure how this is handled at all within the engine as I'm not really a programmer. Any help getting me to understand this better would be very appreciated. At the moment I'm thinking of a queue system where the manager checks if the game object variable is null or if it has something. if it has something then it puts it into an array. it would be easier if I could just add to an array from another fsm but I can't as far as I know. Was easier with the downloadable arrays to be honest. but even if I decide to download them and use them instead of the ones that come with playmaker now, I'd still like to know how this mechanism works. if the state machine is a single item or if it creates a new manager whenever it gets called from another object. I'm not really sure if any of this is making sense. Maybe programmers know exactly what I'm on about, maybe not lol. I don't know. any help is appreciated though.